This is to be used in conjunction with the third edition manual which can also be found on our website. The innovations that can be applied to this prototype going forward are numerous. 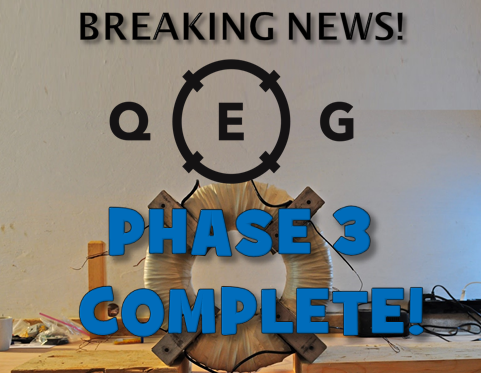 In staying with the true co-development nature of this endeavor, we are leaving these further innovations up to the creative expression of the engineers and inventors that are working on the QEG. To describe this new and last piece of information, it is a step-by step detailed procedure for tuning the machine to enable the QEG to self-sustain with additional power output. Again, we state: THIS IS WHAT THE ENGINEERS HAVE BEEN WAITING FOR. It is open sourced and it is freely given as a gift to the world. This also confirms that the QEG as shown to the world by WITTS is a working device. All instructions received by James from WITTS has been verified. The original intent of the project was to build a “free energy” generator prototype scaled large enough to power an average home, and to develop a set of instructions that would allow others to replicate the device and to give them away for free on the internet. To the best of our ability, and with great personal difficulty of our own, we have been able to deliver that which we set out to do. With this final piece we are now closing the public project of the QEG. For the FTW QEG family team, further innovations for the QEG and its development will be conducted in a privatized manner. 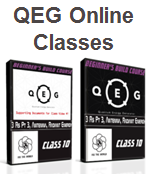 QEG Questions and Answers: An updated series of FAQ’s that should answer most questions we receive. Please note, we no longer have the ability time or resources to answer individual questions so have provided these FAQ’s and other materials listed here for free. However, James will be available for scheduled consulting sessions. QEG For Beginners Summary of Links: This will give new people every link necessary to self educate themselves on all the work on the QEG project done over the last two years. The Underbelly of the QEG Project: Disclosure report of the negative aspects of what the QEG family faced during the QEG project. QEG Consultations and Build Requests: James is available for scheduled consultation sessions and also to build QEG’s on location. If you would like to hire James please contact him through the email address on this link. FREE WEBINAR!! 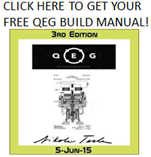 “HOW TO GET YOUR QEG TO OVERUNITY” July 20 2015 We will be holding a FREE webinar for anyone that wishes to attend, on July 20th presenting: “How to Get Your QEG to Overunity”. Please sign up for the webinar at the link above. QEG Rosetta Stone Campaign : We are raising funds to get this information translated into 10 languages. We have translated 3 languages so far and need help funding the other 7 translations. Please visit the Rosetta Stone Campaign if you would like to help. Fix the World Start up Campaign : If you would like to help the FTW organization to raise the start up needs to implement this work please visit our FTW start up Campaign. FTW Memberships : You can become a member of the FTW organization for $6.99 a month or $75 for the year. 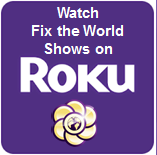 Members receive access to an amazing array of shows, and our monthly newsletter. We donate 10% of all proceeds to people in need through Kiva. 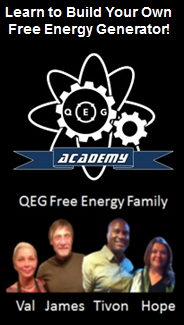 FTW Business Plan and Benefactors : We will be completely revising our FTW Business plan to lay out the strategy and funding needs for our entire organization that includes a Free Energy Technology Lab. If you would like to become a benefactor of the FTW mission and/or receive our new business plan when its done please sign up for this mailing list at the link above. FTW/QEG Donations : If you would like to help out the FTW family or Organization in any amount you can always make a donation to us here. Every little bit helps us to keep doing this work! Contact HopeGirl / FTW / QEG Team : If you need to contact us this page gives the correct email addresses to reach us. What you also need to know is that this project has taken almost everything we had. We lost our home, had to move several times in the past year, and lost much of the equipment we need to have the kind of operational lab we need to do this work. We have run out of resources and simply cannot do anymore going forward without funding. We hope that all of you can understand that this last vital piece of the project has been brought to you at a great personal sacrifice. We are now looking for humanitarian benefactors. We are looking for true philanthropists who can help. Its time we put people before technology. After being on this road for 2 years we have seen and heard many things. Too often we come across investors that are only interested in the technology and care nothing about the people that are building the technology. Its time we realize that there is a living human being that is building these devices, and that person needs food, shelter, basic needs and decent tools to do the job. This not only goes for my family, but for ALL the inventors out there that have been struggling and working to build a better future for all of us. For those who wish to contribute to a greater cause that can directly affect and change the lives of millions of people all over the planet – We need your help. As an organization we have the ability to bring cheap or free electric power to people in need, and we also have many other projects that involve bringing clean water, healthy food, and ending poverty in areas all over the world. These projects will not only help people and save lives, but they will give people the opportunity they need to generate their own sustainable income and boost the economy around them. We have held onto the plans for these 60 projects for close to three years and we need the proper funding to implement them. So what does this mean for all of us? We have taken old knowledge of natural energy production, knowledge that has been suppressed for over 100 years, and we have made it known and accessible. But knowledge and action are two very different things. We cannot control, nor do we wish to control, what people will do with this. We can only hope that others will pick up the torch that my family has been bearing for these past two years and carry it on further than we ever could. 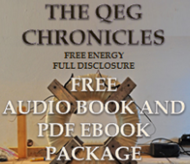 The QEG and its unique form of energy production, along with other similar devices, can and will change the paradigm of our world. But changes of this kind do not happen overnight. They happen over a period of time, and in some cases over a period of generations. New beginnings are a very delicate matter. If you’ve been waiting, now is the time to start building. Get involved, take action and help spread this gift across the planet. We have done everything we can to get this to you. Right now it is in YOUR hands. We have done this great feat so that the work of Nikola Tesla was not done in vain. We now pass this torch onto you and sincerely ask you all to use it to help your families and your communities. We have opened the door, its now up to all of you to walk through it. It has been an honor to serve in this amazing endeavor. Thank you all for your love and support. Now lets all go out there, and build our brave new future- together! Hi Hopegirl, thank you for the hard work yourself and James have done! I have not built the QEG (yet) but hope to one day. I want to offer an invention of my own to help you sustain (food, shelter, other things needed for life). I’ve built a system that aggregates these supplies to people and think it could help you both. What is the best way to contact you to connect on this? You may mail your project idea to fixtheworldproject@gmail.com. Thank you very much. Thank you. Together we can complete this mission.